WASHINGTON — D.C. City Councilmember Trayon White Sr. (D-Ward 8) says that a friend was behind the wheel of his BMW when it was involved in what the Metropolitan Police Department (MPD) is investigating as a hit-and-run. MPD will only release police reports for crashes to the parties involved and their respective legal teams, but The Washington Post was able to obtain a copy of the report, which said a Toyota Camry was struck from behind on Interstate 295 by a BMW with D.C. government plates close to midnight on Monday. 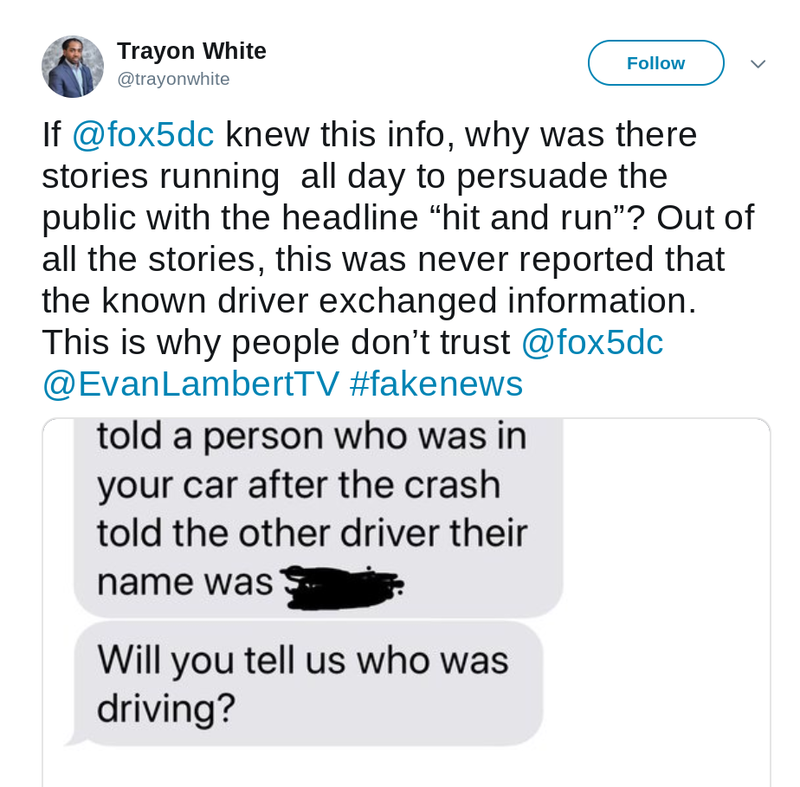 White lashed out at Fox5 News on Twitter, saying that their report of what he termed “a minor fender bender” as a hit-and-run was inaccurate and “this is why people don’t trust [Fox 5],” adding the hashtag “#fakenews” to his tweet. Fox5 did report the incident as a hit-and-run, as did The Washington Post, attributing the classification to the District’s police chief. White released a statement saying that the vehicle was taken by a friend without his knowledge or permission. He also called into the “Angie Ange In The Morning” radio show to explain himself, saying that a friend used his spare key to take the vehicle and the media coverage was inaccurate. White made headlines not long ago when he claimed Jews control the weather. A subsequent apology visit to the Holocaust Museum was bungled when members of his staff compared a Warsaw ghetto to “a gated community” and White himself left early, something many considered quite rude, especially given the circumstances. The morning after the hit-and-run, the D.C. City Council held a special legislative meeting to reprimand another Democrat, Jack Evans, for separate ethics violations. 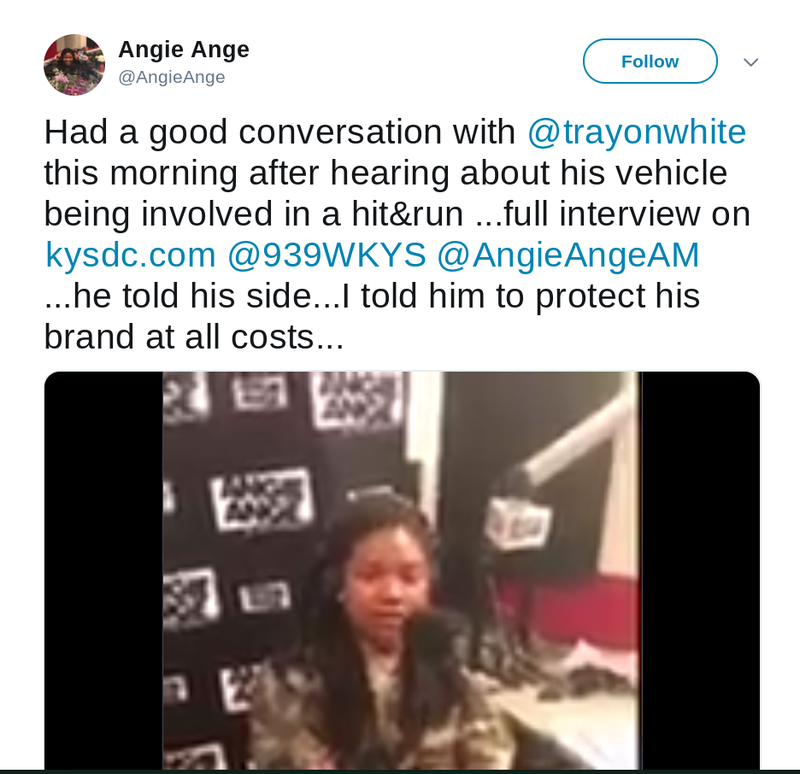 The hit-and-run involving Trayon’s White vehicle had not yet been reported by the media and White spoke at the meeting, saying, “We take an oath to faithfully discharge the duties of our office,” before reading aloud several sections from the Code of Conduct.